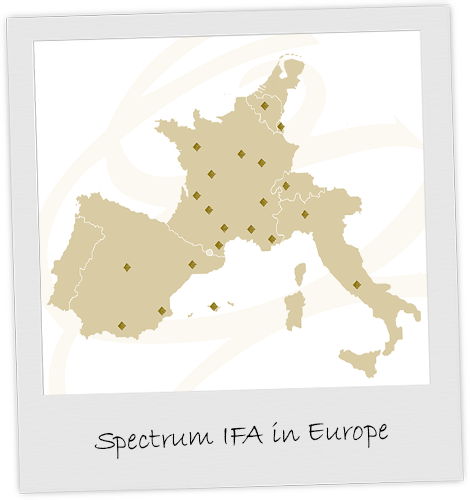 The Spectrum IFA Group was established in January 2003. Our financial planning advisers* demonstrate their long-term commitment to both their clients and the locality by residing permanently within the community in which they work. They have an understanding of expat life and the particular financial rules that apply in your country. Our advisers are qualified, experienced and regulated. Our financial planning team in our Barcelona office alone has over 83 years experience in financial services. In total we have over 50 financial advisers across Europe. Our role is to create and provide solutions for expatriates and foreign residents by way of a broad range of products and services. These include currency exchange, bank accounts, tax efficient investments, QROPS, pensions, medical insurance and more. We also offer wealth management, where appropriate. We design solutions for clients, where possible, that are cross border. For example, someone working in Spain, who subsequently moves to the UK but then retires to France will be able to retain their financial planning in each of those countries. The Spectrum IFA Group comprises a group of companies formed in a number of jurisdictions. Spectrum continues to grow its business and expand distribution into other Western European territories as and when the market opportunities and legal framework are in place. But enough about us, see how we can help YOU! * In most EU Countries, financial planning advice is provided using and within highly tax efficient Insurance contracts. I first contacted Alan must be close to 30 years ago, I heard about him from a colleague in The Hague. My need was to search out a mortgage for my recently divorced daughter, he arranged it in no time, making my local Dutch and long term British Bank contacts look somewhat incompetent. From then on, as they say, the rest became history. Alan managed our investments, which were increased by a rather large inheritance. We never had reason to complain about the results, he actually sold funds before markets fell away to protect our portfolio. He knows his business well, so we have benefited from a long and always aggreable experience. I am glad my old colleague passed on Alan’s card. Alan has always listened to our needs rather than pushing products at us, unlike many advisors he has always presented clear competitively priced options in a simple and straightforward way. We have known Alan for just over a year now, since he advised us to move the British Investments that we have had for some time to Investments that are more tax-efficient in France. We are cautious with our money and have always tended to use do-it-yourself methods for managing our finances. We were therefore not entirely sure about placing ourselves in someone alse’s hands. However, we have absolutely no regrets about using Alan’s services. He explained everything very clearly to us and never pressurised us. He is very friendly and helpful and also super-efficient – the response to an e-mail always arrives within hours. He is happy to travel up to our house in the mountains and this face-to-face contact has made working with Alan a great pleasure. My wife and I have been working with Alan Watson of Spectrum IFA Group for a couple of years now. He provides us with financial planning advice and manages some of our investments here in France. We like the fact that Alan is local and therefore is able to travel and we usually are able to meet face to face. He is always quick to respond, and actively keeps us informed on relevant financial information. Alan has many years of experience, and good knowledge of both UK and French financial markets which has helped clarify and simplify things for us. He is a pleasure to work with. We were told about Graham be a friend and we found him very charming, very professional and thorough. We can only say that we have been delighted with his advice and the work that he has carried out for us and the professional manner in which this was done. We have absolutely no doubt that we are in safe hands and cannot recommend him highly enough. Throughout our discussions your service and attention to detail have been exemplary. The investment options were all very clearly explained and at no point did I feel pressured to make any decision. I have no hesitation in recommending you to anyone considering their investments and financial future. Jonathan Goodman has always been a reliable and totally trustworthy advisor to me. He has always understood my own specific requirements and offered me the best options to fullfill them. He recognises my personal obtuseness, financially speaking, and patiently and charmingly explains the possibilities to me. It is simply a pleasure to meet with him and know that he has my best interests at heart. Thank you very much and pardon the late reply. I’m setting camp in Abu Dhabi and haven’t yet got an Internet connection. It’s all great news. You’ve done an outstanding job and I thank you. I’m looking forward to a meeting with you, so we can discuss this and future investments. I’ll be coming to the island by mid December, I hope. I’ll let you know. Thanks for keeping me posted. It’s wonderful to deal with good professionals like you. My Spectrum adviser has advised me on many aspects of financial planning, from life insurance through to seeking finance for a business project. At all times he has been thorough, made decisions in my best interests and in tune with my requirements. I have known this Spectrum IFA Group adviser for 8 years. She is with out doubt the most dedicated, conscientious and knowledgeable financial adviser I have ever met. She applies the same dedication to both small and large investment clients and is a credit to her company and profession. Whilst at HSBC I presented client seminars with Spectrum advisers in Barcelona. It is clear that they have an excellent relationship with their clients due to their attentive and professional nature. The Barcelona Team has proved to be great ambassador for the Spectrum Group.